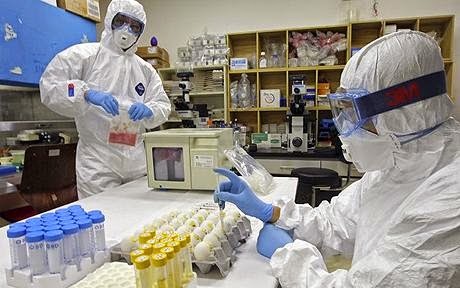 2,000 deaths expected for each year of research on how to turn avian flu into a more deadly virus. That’s the estimate in a new analysis by Harvard University’s Marc Lipsitch, professor and director of the Center for Communicable Disease Dynamics in the Harvard School of Public Health. I heard Lipsitch present his results at an invitation-only hearing held at the National Academy of Sciences on December 15. The purpose of the two-day meeting, which was organized by the National Science Advisory Board for Biosecurity (NSABB), was to discuss the risks and benefits of “gain of function” research on viruses, especially the influenza virus. What is gain-of-function (GOF) research? In this context, GOF means experiments designed to give a pathogen new powers, such as the ability to infect new species, or to jump from person to person more easily. Scientists have already conducted GOF experiments on the flu virus, and now they are considering other viruses including SARS and MERS. What prompted the NSABB hearing was the series of experiments by researchers in the U.S. and the Netherlands designed to transform avian influenza (or “bird flu”) into a human-transmissible virus. These novel, lab-created flu strains have the potential to cause a worldwide pandemic. When virologists Ron Fouchier and Yoshi Kawaoka first published their experiments two years ago, the public, the press, and many members of the scientific community (including me; see here and here) expressed serious alarm. After a brief hiatus, though, the experiments continued. In mid-October, the U.S. government announced a “pause” in gain-of-function experiments, which has Fouchier, Kawaoka, and their colleagues very upset. At the NSABB meeting in December, the vast majority of panelists were influenza researchers defending GOF research, arguing that it could lead to valuable insights about the flu. As a group, they seem to have convinced themselves that everything is fine, and they want to tell the rest of us that there’s nothing to worry about. Prof. Lipsitch (and a couple of other speakers) stood out as a voice of reason. He was one of the very few scientists who took a hard look at the risks and also pointed out alternative, low-risk methods for answering the same scientific questions. Lipsitch conducted a careful risk analysis (something apparently not even considered by Fouchier and Kawaoka) looking at the chances of a virus escaping a lab, of such a virus causing further infections, the likely number of fatalities, and more. It turns out that the scientific community has excellent data quantifying all the key variables involved, as Lipsitch documented. He and his colleague Tom Inglesby just published these figures, with supporting data, in the journal mBio. Using conservative estimates, many of them provided by influenza researchers themselves, Lipsitch calculated that for each year of gain-of-function research on pandemic viruses, we can expect at least 2,000 fatalities worldwide. And that’s only the low end: at the other extreme, this estimate rises to 1.4 million fatalities per year. Lipsitch also described many other ways to study and defeat influenza, all of them with little or no risk, which he’s published in the journal PLoS Medicine. His point is that even if we accept the supposed benefits of GOF research, there are far less risky ways to obtain those same benefits. One of the most ironic–or outrageous–claims of the pro-GOF scientists is that these experiments will help us predict future pandemic flu strains, and even help us design a vaccine in advance of outbreaks. The irony is that this year, the seasonal flu vaccine is a poor match to the strains that are circulating. This vaccine was chosen only 9 months ago, based on extensive surveillance of circulating flu strains, demonstrating how difficult it is to predict even the regular seasonal flu. As a result, we’re having a very bad flu season this year (aside: it's still worth getting the flu vaccine). 2000 deaths per year. And that’s only the direct risk: what about the risk from publishing these experiments? What happens when we provide instructions on how to build deadly biowarfare agents to anyone with an internet connection? Indeed, “gain of function” research on pandemic pathogens is really biowarfare research, which supposedly ended after the Cold War. I’m a huge supporter of biomedical research and of NIH in general. NIH research has yielded tremendous benefits to the public health, as I’ve written before. We don’t need to overreact by cutting medical research in general, but we can make the “pause” in gain-of-function research permanent. There are far better things to do with our research funds. If you want to register your concerns, write to the NSABB at nsabb@od.nih.gov and tell them to recommend a permanent halt to gain-of-function research on pathogenic viruses. The best explanation lead you towards the right.